In the early part of the 20th century, Max Wertheimer published a paper demonstrating that individuals perceived motion in rapidly flickering static images—an insight that came to him as he used a child’s toy tachistoscope. Wertheimer, and his assistants Wolfgang Köhler and Kurt Koffka, who later became his partners, believed that perception involved more than simply combining sensory stimuli. This belief led to a new movement within the field of psychology known as Gestalt psychology. The word gestalt literally means form or pattern, but its use reflects the idea that the whole is different from the sum of its parts. In other words, the brain creates a perception that is more than simply the sum of available sensory inputs, and it does so in predictable ways. Gestalt psychologists translated these predictable ways into principles by which we organize sensory information. As a result, Gestalt psychology has been extremely influential in the area of sensation and perception (Rock & Palmer, 1990). One Gestalt principle is the figure-ground relationship. According to this principle, we tend to segment our visual world into figure and ground. Figure is the object or person that is the focus of the visual field, while the ground is the background. As the following Figure shows, our perception can vary tremendously, depending on what is perceived as figure and what is perceived as ground. Presumably, our ability to interpret sensory information depends on what we label as figure and what we label as ground in any particular case, although this assumption has been called into question (Peterson & Gibson, 1994; Vecera & O’Reilly, 1998). 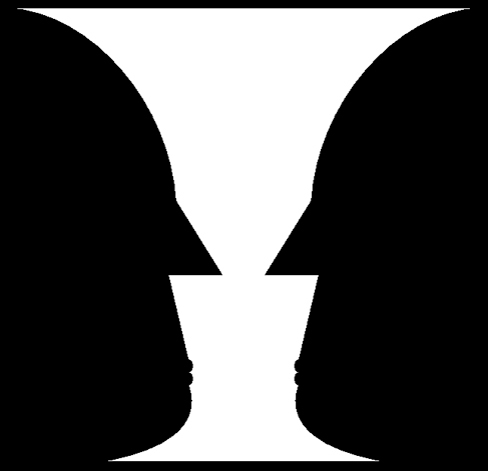 The concept of figure-ground relationship explains why this image can be perceived either as a vase or as a pair of faces. Another Gestalt principle for organizing sensory stimuli into meaningful perception is proximity. This principle asserts that things that are close to one another tend to be grouped together, as the following Figure illustrates. The Gestalt principle of proximity suggests that you see (a) one block of dots on the left side and (b) three columns on the right side. How we read something provides another illustration of the proximity concept. For example, we read this sentence like this, notl iket hiso rt hat. We group the letters of a given word together because there are no spaces between the letters, and we perceive words because there are spaces between each word. Here are some more examples: Cany oum akes enseo ft hiss entence? What doth es e wor dsmea n? We might also use the principle of similarity to group things in our visual fields. According to this principle, things that are alike tend to be grouped together. For example, when watching a football game, we tend to group individuals based on the colors of their uniforms. When watching an offensive drive, we can get a sense of the two teams simply by grouping along this dimension. 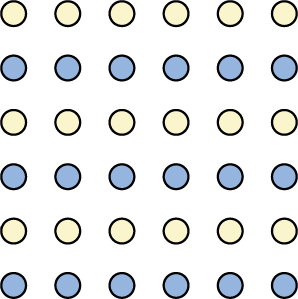 When looking at this array of dots, we likely perceive alternating rows of colors. 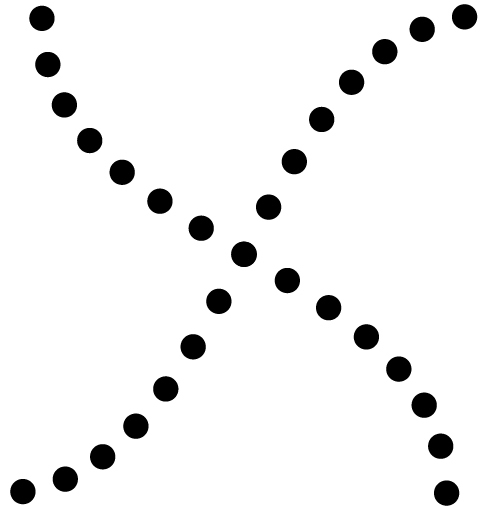 We are grouping these dots according to the principle of similarity. Two additional Gestalt principles are the law of continuity (or good continuation) and closure. The law of continuity suggests that we are more likely to perceive continuous, smooth flowing lines rather than jagged, broken lines. The principle of closure states that we organize our perceptions into complete objects rather than as a series of parts. Good continuation would suggest that we are more likely to perceive this as two overlapping lines, rather than four lines meeting in the center. Closure suggests that we will perceive a complete circle and rectangle rather than a series of segments. According to Gestalt theorists, pattern perception, or our ability to discriminate among different figures and shapes, occurs by following the principles described above. You probably feel fairly certain that your perception accurately matches the real world, but this is not always the case. Our perceptions are based on perceptual hypotheses: educated guesses that we make while interpreting sensory information. These hypotheses are informed by a number of factors, including our personalities, experiences, and expectations. We use these hypotheses to generate our perceptual set. For instance, research has demonstrated that those who are given verbal priming produce a biased interpretation of complex ambiguous figures (Goolkasian & Woodbury, 2010). In this chapter, you have learned that perception is a complex process. Built from sensations, but influenced by our own experiences, biases, prejudices, and cultures, perceptions can be very different from person to person. Research suggests that implicit racial prejudice and stereotypes affect perception. For instance, several studies have demonstrated that non-Black participants identify weapons faster and are more likely to identify non-weapons as weapons when the image of the weapon is paired with the image of a Black person (Payne, 2001; Payne, Shimizu, & Jacoby, 2005). Furthermore, White individuals’ decisions to shoot an armed target in a video game is made more quickly when the target is Black (Correll, Park, Judd, & Wittenbrink, 2002; Correll, Urland, & Ito, 2006). This research is important, considering the number of very high-profile cases in the last few decades in which young Blacks were killed by people who claimed to believe that the unarmed individuals were armed and/or represented some threat to their personal safety. Gestalt Principles of Perception by Rajiv Jhangiani, Ph.D. is licensed under a Creative Commons Attribution 4.0 International License, except where otherwise noted.